You're subscribed to the newsletter if you received it directly. Did a friend FORWARD this newsletter to you? Click here to get signed up! American Heart will air on America ReFramed Jan. 20! We are honored that American Heart has been selected for the third season of a remarkable TV series, America ReFramed. Our episode will air on the World Channel, a PBS sister network, on Tuesday, January 20. This primetime, nationwide appearance on America ReFramed is a big moment for us. In many ways, this is the culmination of everything we've been working toward, with the opportunity to reach millions of Americans. Join us in celebrating, and Thank You to everyone who has been supportive throughout the years! In conjunction with our television broadcast, America ReFramed will also be hosting a live online screening of American Heart on Wednesday, January 21 at 7pm Eastern. The screening will be followed by an interactive discussion with series host Natasha Del Toro and filmmaker Chris Newberry. Sign up here and join us for a virtual get-together! And please help us spread the word to individuals and organizations. In partnership with Healthpartners Center for International Health, we have created two spinoff DVDs by taking some of the stories told in American Heart and reinterpreting them for a learning environment. 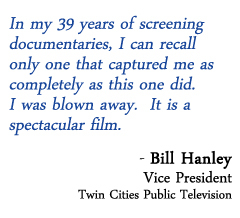 Each of the Global Village DVDs is 12 minutes long, and part of the proceeds go to fund continuing medical education at the University of Minnesota. You can purchase them at our partner website The Medicine Box Project for just $6.50, or $10.50 for both! They make great standalone learning tools, but they also can serve as companion pieces to American Heart. Prices have been reduced, so now's your chance to get your hands on American Heart. Depending on intended usage, prices start as low as $19. Know somebody who would appreciate American Heart? You can help us with our word-of-mouth campaign! If you missed Issues 1-9, you can see them in our archive. Director Chris Newberry discusses the film. DVD short films from the makers of American Heart. Copyright © 2015 Chris Newberry Productions, All rights reserved. This project was funded with money from the Arts and Cultural Heritage Fund that was created with the vote of the people of Minnesota on November 4, 2008.